This month’s #PresidentsChoice PC Black Label Collection box included a favourite of mine, which is PC Black Label Habanero Aioli Whipped Dressing! This velvety aioli has complex flavours of sweet mango purée, curry, and a subtly hot habanero kick. It’s a great condiment to eat with french fries, swirled into a salad dressing or used as a side replacing ketchup or mustard. It’s so versatile that I even serve it with my maple glazed salmon and my kids love it! Another product that I received this month is the PC Black Label Bacon Marmalade, which is great on a cheeseboard and is a welcomed addition to our pantry. I have created a simple recipe this month using PC Mixed Little Gems Yellow, Red & Blue Mini Potatoes. I have sauteed them with butter and olive oil and then tossed with this PC Black Label Habanero Aioli. To make this side dish the perfect accompaniment to your meal, I have also included my recipe for Maple Glazed Salmon below. I hope you enjoy this recipe and please feel free to tag your recreations with #hautesucre, I would love to see them. 1. In a large heavy bottomed frying or sautée pan, add the butter, olive oil and sliced potatoes. 2. Cover and cook on medium heat for 5-6 minutes. 3. Remove the lid and add the salt, pepper, herbs de Provence seasoning and maple syrup. 4. Continue to cook until the potatoes are softened and start to caramelize. About 10-15 minutes, depending on potato size. 5. Add the PC Black Label Habanero Aioli, covering the potatoes completely. 6. Cook on high heat until slightly seared, do nut burn (approx 1 minute). Remove and transfer to a large platter. 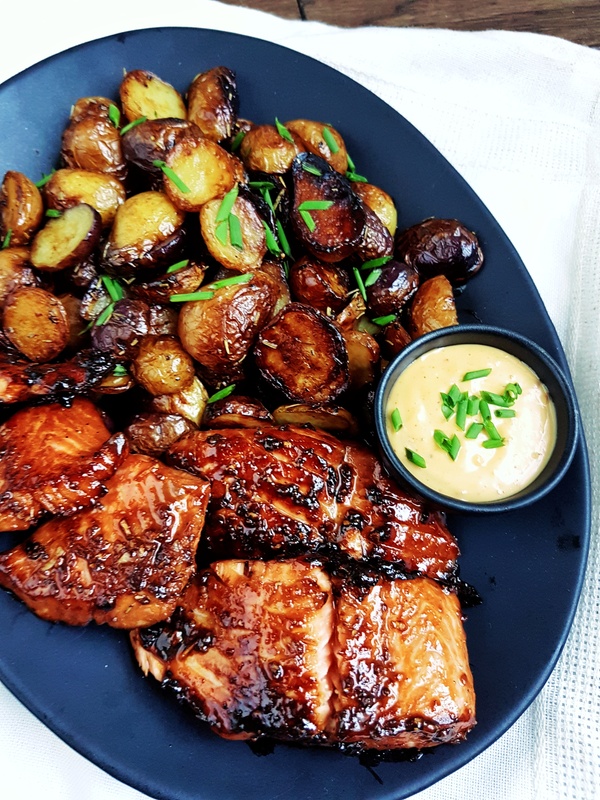 This recipe works best with salmon fillets due to the complementary flavours in this marinade; but feel free to try it with other kinds of fish. 2. Combine all the ingredients and coat the fish with the marinade. Set aside for about 25 minutes to allow the flavours to meld. 4. Transfer to a baking dish and place a little sesame oil to coat the bottom. Lay fish in a single layer and pour over remaining marinade. 5. Roast the fish for approx 15 minutes (do not overlook) and put under broil for a few minutes to slightly char the top. 6. Alternatively, you can bbq it or pan fry it. 7. Serve with Habanero Aioli Potatoes and additional Habanero Aioli on the side.